A couple of Mayoral candidates on the right of politics have recently proposed that Councils should take punitive steps to stop begging. Mark Thomas says the issues of begging and homelessness is not a problem for the council to solve alone, and labelled Len Brown’s 10-year plan “ineffective”. “Auckland Council is not making fast enough progress,” he says. The current bylaw, enforced in 2013 by Len Brown, requires beggars to intimidate or cause a nuisance in order to be removed. Mr Thomas says the government needs to “meet its responsibility” to end the issue of begging, while the council focuses on ensuring “streets and public places are respected”. Temporary shelters such as vacant government and council houses could be a solution, he says. Begging is often driven by addiction (drugs and alcoholism) and crime; sadly mental health issues complicate matters further. People assume beggars are homeless, but that’s rarely the case” Ms Young posted. She then went on to explain the increase in numbers was partly due to Wellington’s relative wealth and blamed current Mayor Celia Wade-Brown for not developing real solutions, instead making the situation worse. “As Mayor I will introduce a by-law banning begging in the CBD and near cash machines – the most lucrative spots in our city – as part of a larger strategy involving the Police, WINZ, the DHB and charities,” she said. It is good that they both agree that the causes of homelessness are complex. But thinking that a by law, where the usual sanction is a fine, is a potential solution ignores the fact that poverty and an associated inability to pay fines is a significant contributor to the problem. It is good that the approach of the conservatives is being moderated and they want to address causes of homelessness. Previously the approach adopted was less worried about causes and more about taking punitive action. 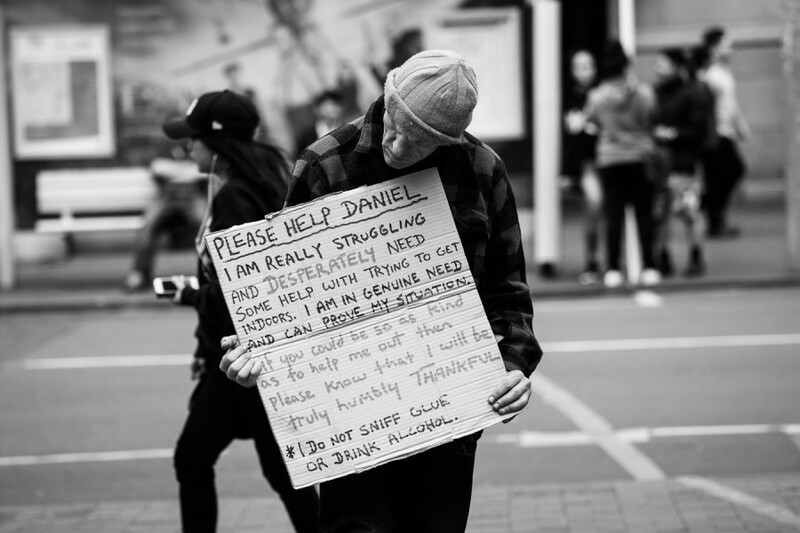 For instance in 2008 then Auckland City Councillor and current Minister of the Crown Paul Goldsmith championed a bylaw under which someone found begging without a permit could be required to leave the area. Failure to do so would constitute an offence punishable a fine of up to $20,000. A few years ago Palmerston North thought about a bylaw but its staff did something quite innovative. They interviewed the local homeless people to try and determine what the causes of their being homeless were. As I noted previously the staff report recorded that most were on benefits and that all but one had mental health problems. What are the current dynamics at play? Clearly there is a housing affordability crisis in Auckland which a bylaw has no hope of addressing. And there are concerning signs that the social welfare net is not working as well as it should do. Last quarter the Labour Market Statistics released by the Government showed a reduction in the Labour force participation rate for the third quarter in a row. Instead of looking for work this suggests that more people are giving up looking for work. And what can a Council do? Imposing fines will not work. As stated in that famous saying by Anatole France that “[t]he law, in its majestic equality, forbids the rich and the poor alike to sleep under bridges, to beg in the streets, and to steal bread”. The best a Council can do is address poverty and its causes.